Get your students hooked on maths with Mabble, crosswords with numbers. 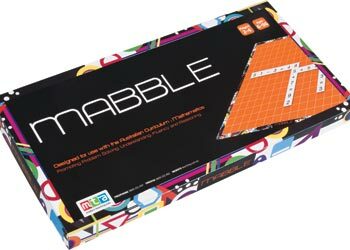 Mabble is a simple, easy to learn game that accesses the Number and Algebra strand by requiring players to come up with mathematical equations in a similar manner to a crossword puzzle. 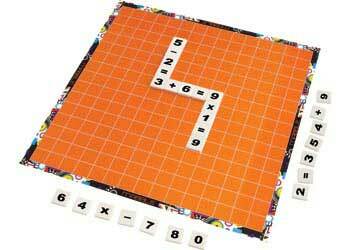 The objective of the game is to gain the highest points from completing numbers sentences on the game board. Place all the number tiles face down on the table, and all of the operation tiles face up. Each player is dealt seven number tiles. The operation tiles remain in one pile, for all players to use. Players take turns to use some or all of their number tiles to make one correct equation. Players must build their equations so that they join or intersect either horizontally or vertically with any existing equation already on the board. After your turn, you replace the number of tiles used by tiles from the pile. For each new equation, players score the sum total of the digits on the tiles and 1,2,3 or 4 points for +, -, x and ÷ respectively. Play until no further tiles are left or no further equations can be made. The player with the highest score is the winner. Mabble provides an excellent opportunity to work on the four proficiencies of problem solving, understanding, fluency and reasoning from the Australian Curriculum: Mathematics. This game is suitable for children and adults of all ages. The game comes with a game board, copy-able scoring sheets and number and operation tiles.